^ A Milky Arc Over Paranal. ESO Picture of the Week. [10 April 2014]. ^ L. S. Sparke, J. S. Gallagher III. Galaxies in the Universe: An Introduction. Cambridge: Cambridge University Press. 2000. ISBN 0-521-59704-4. ^ Hupp, E.; Roy, S.; Watzke, M. NASA Finds Direct Proof of Dark Matter. NASA. August 21, 2006 [2007-04-17]. ^ Unveiling the Secret of a Virgo Dwarf Galaxy. ESO. 2000-05-03 [2007-01-03]. ^ 5.0 5.1 Hubble's Largest Galaxy Portrait Offers a New High-Definition View. NASA. 2006-02-28 [2007-01-03]. ^ Hoover, Aaron. UF Astronomers: Universe Slightly Simpler Than Expected. Hubble News Desk. June 16, 2003 [2007-02-05]. （原始内容存档于2007年2月25日）. ^ 7.0 7.1 Jarrett, T.H. Near-Infrared Galaxy Morphology Atlas. California Institute of Technology. [2007-01-09]. ^ Mackie, Glen. To see the Universe in a Grain of Taranaki Sand. Swinburne University. 2002-02-01 [2006-12-20]. ^ D. Gilman. The Galaxies: Islands of Stars. NASA WMAP. [2006-08-10]. ^ Galaxy Clusters and Large-Scale Structure. University of Cambridge. [2007-01-15]. ^ D. Finley, D. Aguilar. Astronomers Get Closest Look Yet At Milky Way's Mysterious Core. National Radio Astronomy Observatory. 2005-11-02 [2006-08-10]. ^ Roger Highfield. Amateur stargazers map a 'lopsided' universe. Telegraph. 2007-10-15 [2007-12-05]. ^ 14.0 14.1 M.A. Barstow. Elliptical Galaxies. Leicester University Physics Department. 2005 [2006-06-08]. （原始内容存档于2012-09-13）. 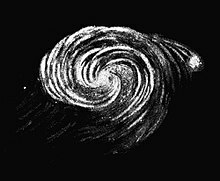 ^ Galaxies. Cornell University. 2005-10-20 [2006-08-10]. （原始内容存档于2012-06-04）. ^ R. B. Tully. The Local Supercluster. Astrophysical Journal. 1982, 257: 389–422.